Holy Days — Holy Day: 12 noon, 7 p.m. In 1943 As World War II raged, Archbishop John A. Floersh envisioned carving a new parish out of Holy Name Parish in the South End of Louisville for a growing Catholic community. By the time the parish was established in February 1944, and Father John P. Hannon was appointed the first pastor, the church was under construction. 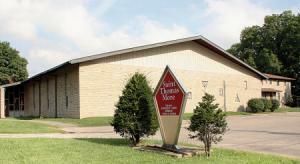 St. Thomas More School, which the Sisters of Charity of Nazareth staffed, opened that September. In the spirit of lay leadership, a school board was created in 1966. Various ministries developed to meet the needs of the 1970s and 80s: Respect Life, Project Hope, Prime Time, a divorced, separated, and widowed group, and others. Four parishes were founded from St. Thomas More—SS. Simon and Jude, St. John Vianney, St. Jerome, and Our Lady of Mount Carmel. Reduced to a square mile and financially limited, St. Thomas More continues to support Catholic education and care for the poor. It has been instrumental in promoting inter-parish cooperation and regional ministries. The parish school closed in 2004 in favor of a regional school, St. Nicholas Academy. The new parish life center, including a gymnasium, accommodates shared uses and public services. With over 1,200 parishioners, St. Thomas More’s renewed vision focuses on the ministry of spreading the Gospel in the South End.